The group enhances the ego … but the self is diminished and put in the background in favour of the average. … Instead of finding security and independence in oneself, which is what is needed, the danger exists that the individual will make the group into a father and mother and therefore remain as dependent, insecure and infantile as before. – Ibid. This is not to deny the widespread desire to change and the genuine search for a transformative experience. But a temporarily heightened awareness does not equal rebirth. You may think you have been forever changed when you are merely inflated with an overdose of previously unconscious material. Many is the analysand who has come to me high as a kite after a weekend workshop and had to be peeled off the ceiling. Positive group experiences are certainly possible. They can spur a person to noble deeds or instil a feeling of solidarity with others. The group can give one a degree of courage, a bearing and dignity that may easily get lost in isolation. But in the long run such gifts are unearned and so do not last. 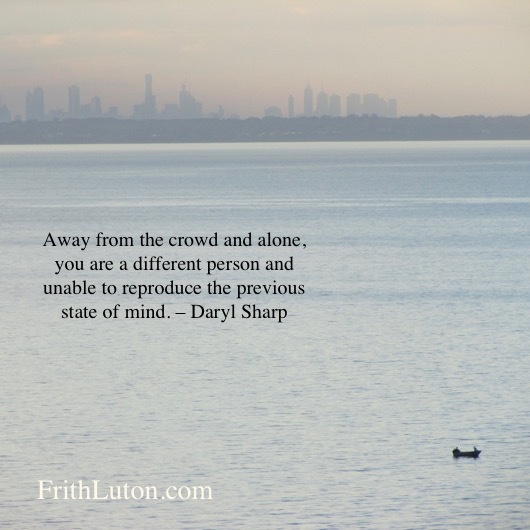 Away from the crowd and alone, you are a different person and unable to reproduce the previous state of mind. For some people, dealing with what happens to them in the course of an ordinary day is either too difficult or too mundane, sometimes both. Esoteric group practices—crystal balls, vision quests, pendulums, channeling and the like—are much more exciting. They tempt with promises few are immune to: deliverance from the woes of this world and escape from oneself. This has been as true for me as for anyone else. Before I went into Jungian analysis I sought enlightenment in the study of [many different fields]—all very interesting, indeed, but when it came to the crunch—when I found myself on my knees—they were no help at all. To my mind, and in my experience, group work can be valuable in terms of individuation only if one’s experience in the group is viewed as grist for the mill of personal analysis, which is where all our wayward chickens come home to roost.